BILLINGS, Mont. (AP) - Federal officials halted plans Friday to ship bison to slaughter from Yellowstone National Park after saying they first had to review a court challenge filed by wildlife advocates. Almost 400 of the animals were being held in corrals inside the park for testing to see if they have been exposed to the disease brucellosis. Officials had planned to begin this week sending to slaughter those bison that test positive. But environmental and American Indian groups are seeking a restraining order from a federal judge in Helena to block the shipments. No shipments are expected while the legal challenge is reviewed by the Park Service, Yellowstone spokesman Al Nash said. Brucellosis can cause wildlife and livestock to prematurely abort their young. About half the park's bison carry the disease, although no bison-to-cattle transmissions have been recorded. "Our plan at the moment is to continue testing and sorting these animals. We'll see what next week brings," Nash said. Court filings indicate the government plans to respond to the request for a restraining order by Monday. No hearings have been set. The case is before U.S. District Judge Charles Lovell. The legal maneuvering comes as the park's iconic bison herds are suffering their worst winter in several years, with deep snows forcing many of the animals out of the park and a much-heralded initiative to expand where they can roam is on the verge of failure. Park workers and state livestock agents have been trying for the last several weeks to halt the animals' exodus from the snow-packed park to lower elevations. 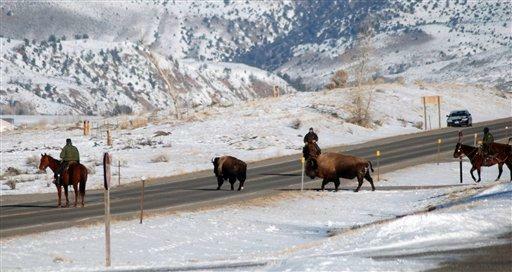 Bison periodically attempt to migrate out of the park in search of food. But many end up in government-operated corrals under a controversial program meant to guard against the spread of the disease brucellosis to livestock. Christian Mackay, executive officer of the Montana Department of Livestock, said Friday that scheduling shipments of any captured bison is primarily a federal responsibility. Through Friday, 224 of the 368 captured bison had been tested. Seventy-six tests came back positive and 148 negative, park spokesman Al Nash said. The corrals hold only about 400 animals. Those involved in the legal challenge said the chance of livestock being infected by bison is too low to justify the death of so many bison - the largest wild land animals in North America. Meanwhile, a $3.3 million initiative to give a small number of bison more to roam outside the park was down to a single animal. Government officials said it was uncertain when or how they would attempt again to carve out new habitat for the species in Montana. The state's Democratic governor, Gov. Brian Schweitzer, suggested another batch of 25 bison could be herded from the park down to the forest land, but there were no immediate plans to do so. Few cattle remain in the immediate vicinity of the park. Wildlife advocates said those conditions make it possible for government agencies to ease their restrictions on where bison can move.